This is a project that we have done at school for about the last 10 years or so, but I realized recently that I’ve never actually finished one myself! Fairly simple, but it is a good lesson in basic joinery methods and face gluing symmetrical pieces. Another thing that this project sets up at school is the unit on mass production. 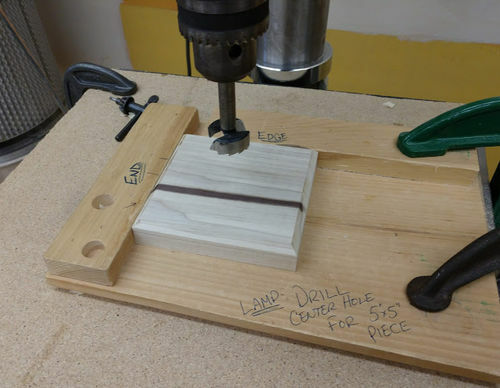 I use several jigs so that the students become familiar with things like stop blocks (for the wire slot routed on bottom) so they learn the benefits of them when making a bunch of pieces. Next we will do a class mass production run. The base piece is 6”x6”, and the overall height is approx 14”. The finish was several coats of spray lacquer to preserve the nice white color of the maple. Now that my job is done, I figured I’ll let the boss (wife) pick out the lamp shades. These will be the lamps we use in our new room, which we just moved into on Friday, 472 Days after we started construction (Halloween 2017). Thanks for looking, comments welcome and feedback appreciated! Lots of good basic woodworking techniques on that Tooch I can see why it’s a favorite. It turned out great. I have to agree, the Ambrosia Maple is always a nice lumber to work with. Love the look of that wood and the lamp bases are a nice way to display it. 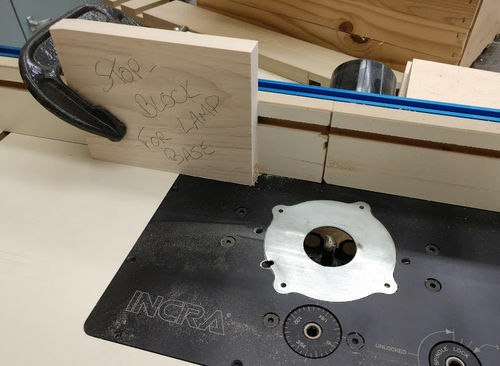 Great idea for teaching, the use of jigs and fixtures is so fundamental to WW and it’s wonderful you are instilling this idea early on. Beautiful lamps, Mike. Great wood used in them!! Great job on the lamps Tooch!